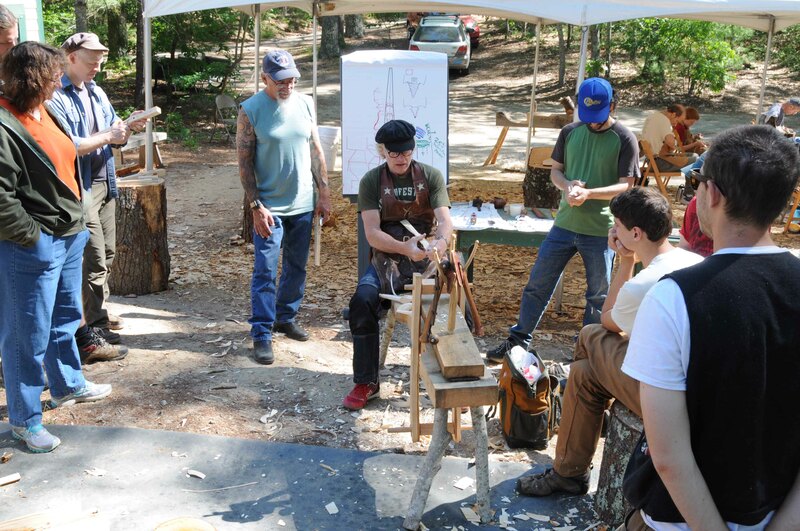 Next Monday, June 4th, the Plymouth CRAFT crew and most instructors descend on Pinewoods Dance Camp in Plymouth Massachusetts to begin setting up Greenwood Fest 2018. We’ve been working pretty steadily prepping stuff for a couple weeks now – Paula wrangling schedules and logistics and Pret & I have been making the next batch of lathes for bowl turning. 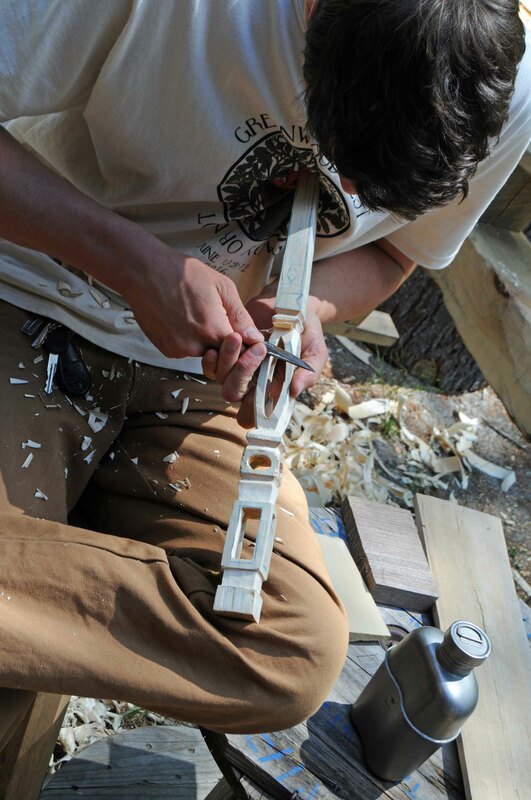 The first season, we used Jarrod Dahl’s lathes, then last year we built 4 lathes and Jarrod brought 4. 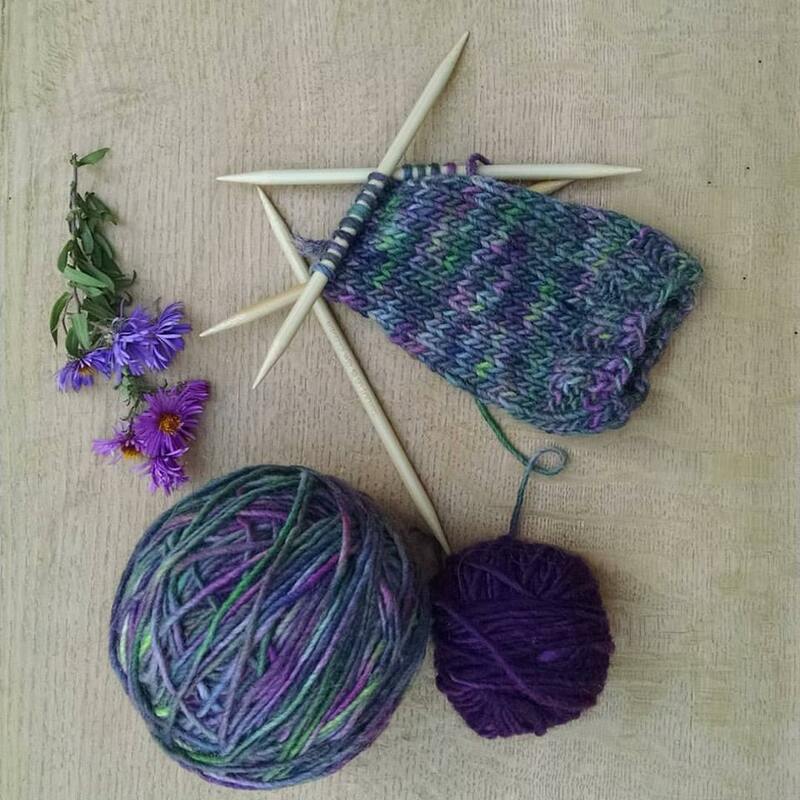 This year, we’ll have 8 of our own, and we’re gathering all the necessary gear – hook tools, treadles, mandrels – Plymouth CRAFT will now have the necessary equipment to host bowl turning classes outside of Greenwood Fest. All we’ll need is a venue and an instructor. 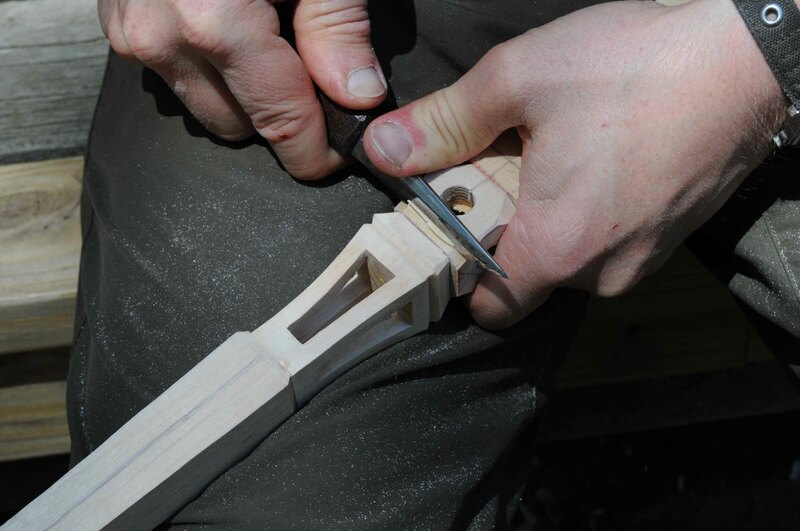 You can tell I made the poppets for the lathes – the wedges that secure some of them are carved. I kept thinking I had loads of time, and at one point I did. But no more. 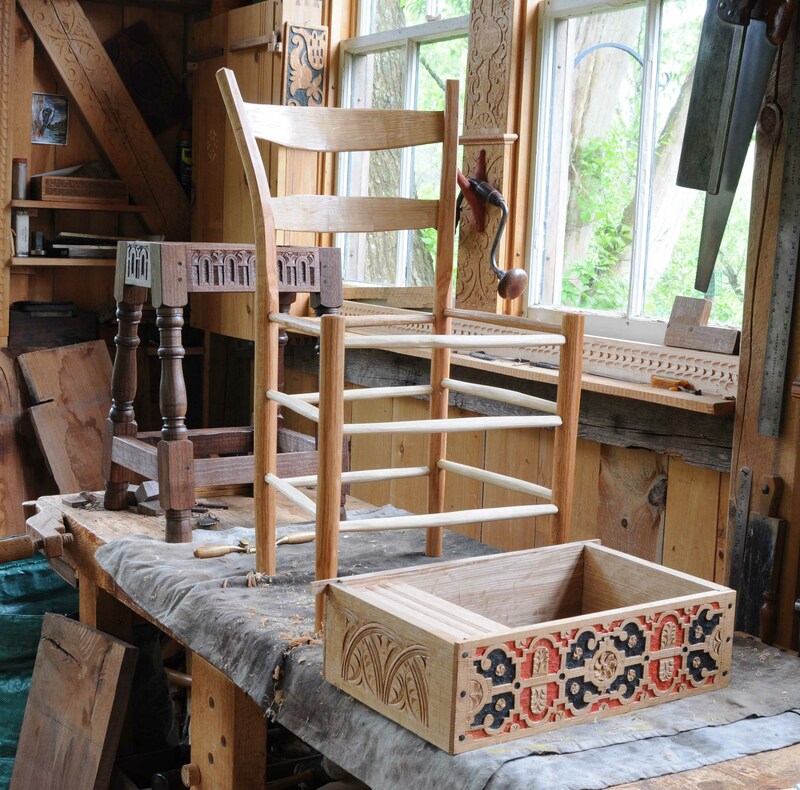 So now I have a scramble to finish up whatever I can so I have something to show in the retail “Greenwood Shop.” Will it be the joined stool? The ladderback chair? The carved box? At least one of those things, I hope. 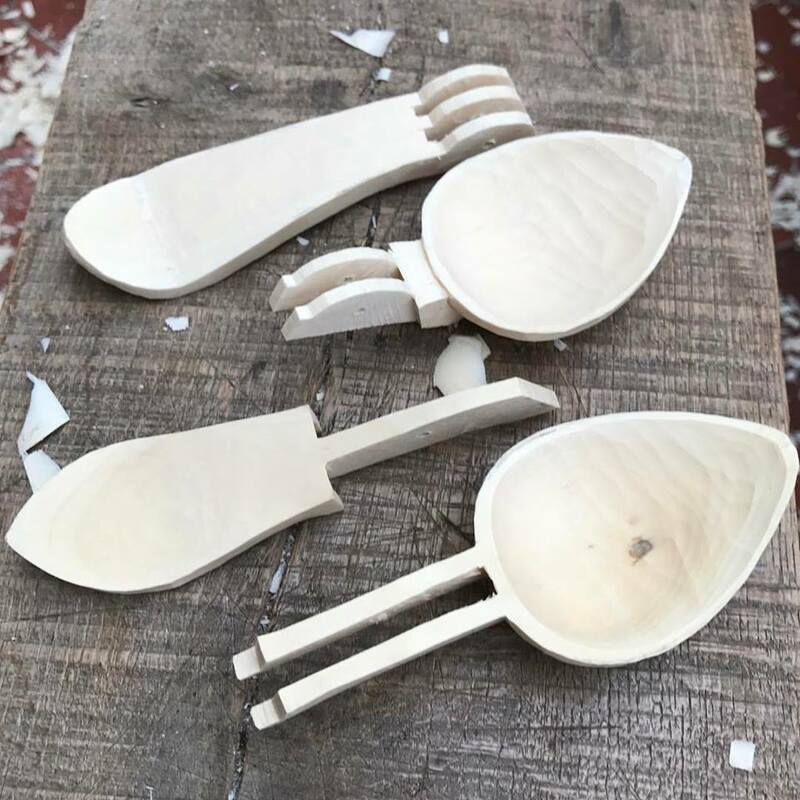 Spoon carvers – Jane Mickelborough’s folding spoon class (hinged spoon, we call it both names) has spaces. It’s an amazing exploration of a traditional form from Brittany. 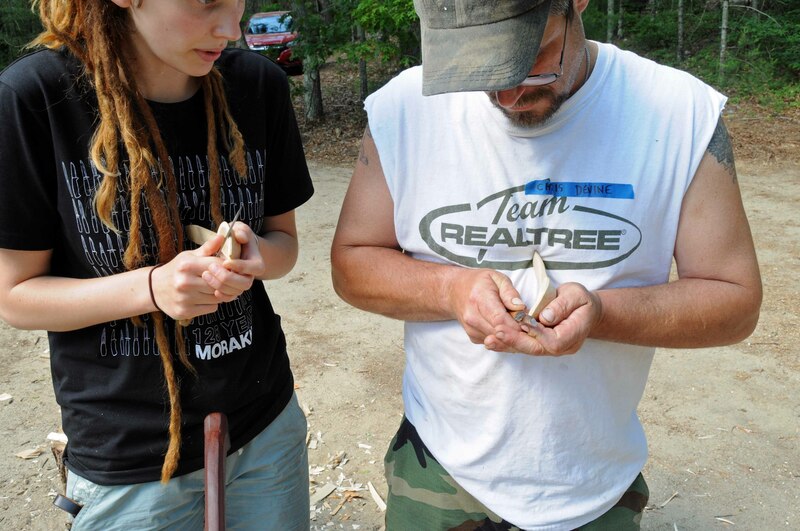 Something different from a lot of the spoon carving going on, but rooted in a local tradition. No one alive knows more about those spoons than Jane. JoJo Wood’s eating spoon class. Someone can get into this fiercely popular class. JoJo has been part of both our previous Greenwood Fests. I’ve written lots about her work since we met in 2014, and I continue to be so impressed with her amazingly detailed and nuanced spoons. 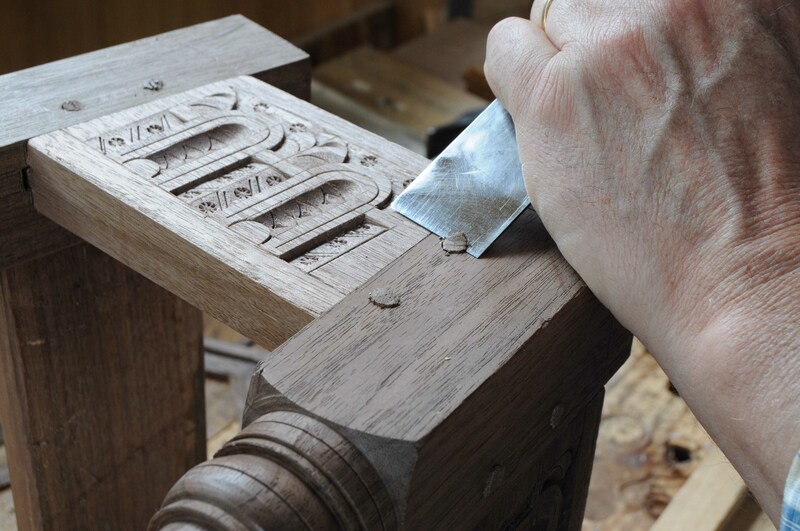 If you’ve paid any attention to spoon carving, she’s one of the top spoon carvers out there. If you’re signed up for the Fest, there’s one thing I’ve been meaning to mention for some time. Paint – as far as I can tell, we’ve not addressed painted finishes in our Fest before. 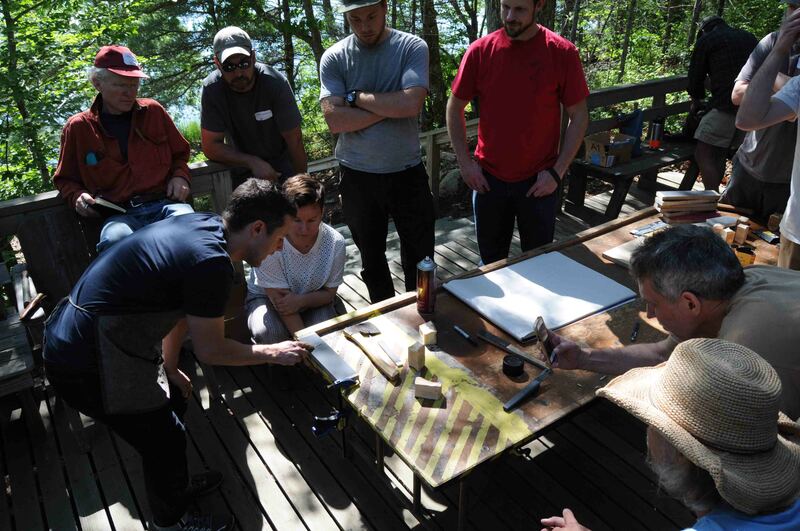 Although we have two masters of milk-paint; Curtis Buchanan and Pete Galbert in attendance, in addition to Jögge Sundqvist (who is not afraid of color) – we have a “new-to-you” artisan – Pen Austin doing some workshops and open demonstrations concerning paint; milk paint and distemper paint. I’m looking forward to seeing more of her work and also seeing people work with her. Should be something. I hope I can poke my nose into some of her sessions, I’d like to learn a bit more about manipulating paint. Back to my list of to-be-dones. It’s spoon-heavy this time at Greenwood Fest. For several reasons, primarily because I went to Spoonfest last summer & got to meet a bunch of new people. 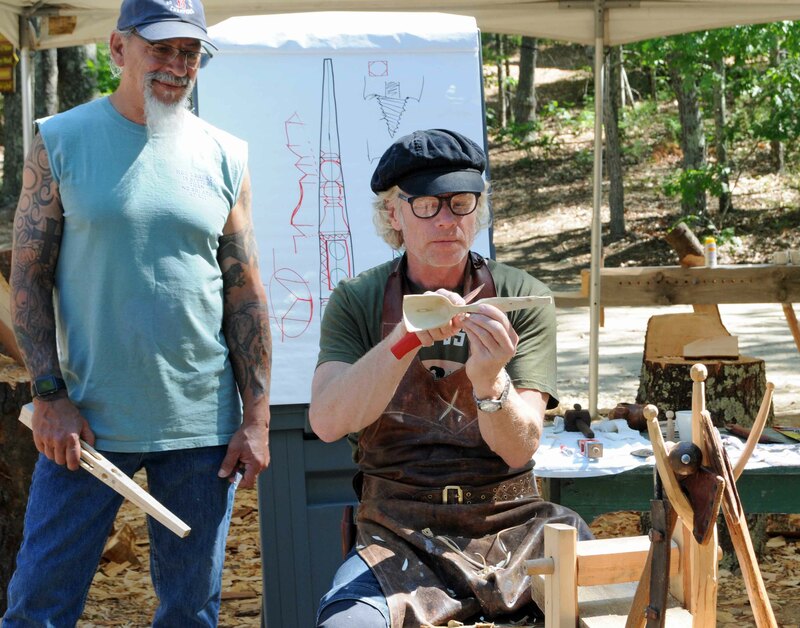 But…in any event, this spoon carver was coming back no matter what. JoJo Wood was one of the first choices last year, and so again for 2017. 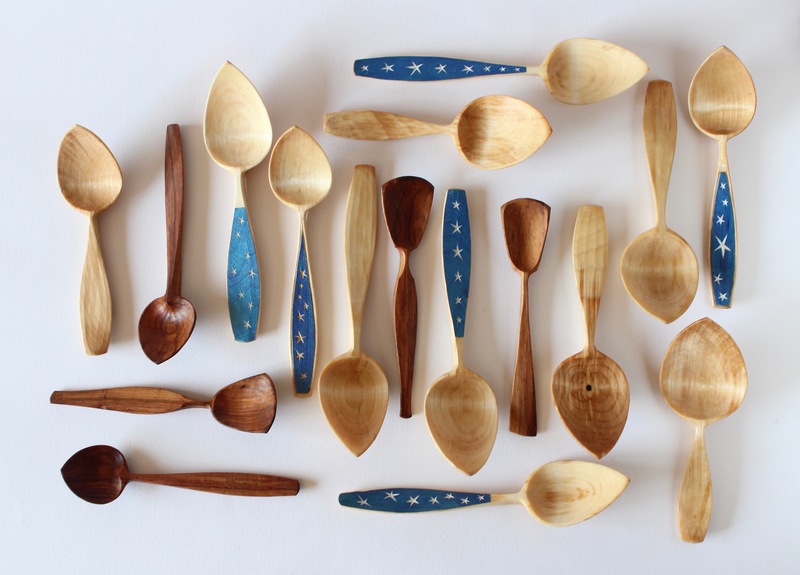 If you are paying attention to spoon carving craze that’s sweeping the world, JoJo is one of the highlights. Her work just stands out in many ways. 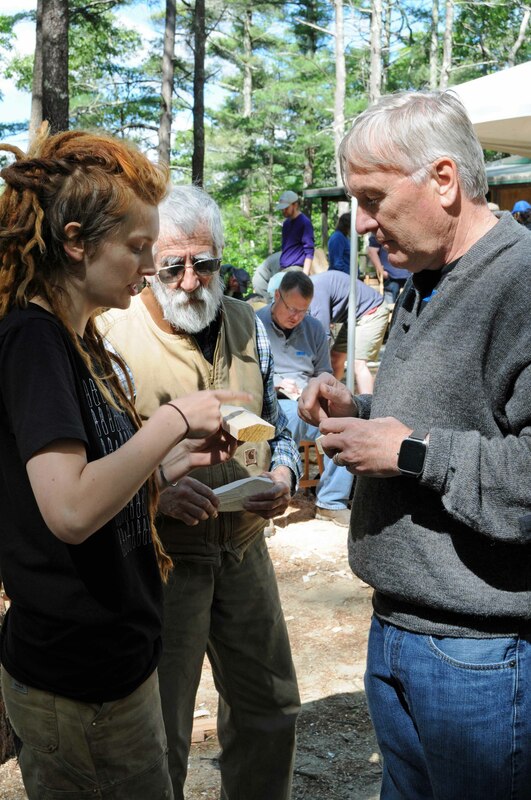 In the first Greenwood Fest, she brought along her clog knives, and showed us how she roughs out the wooden blanks for the soles of the leather-topped clogs. And otherwise, she carved spoons. 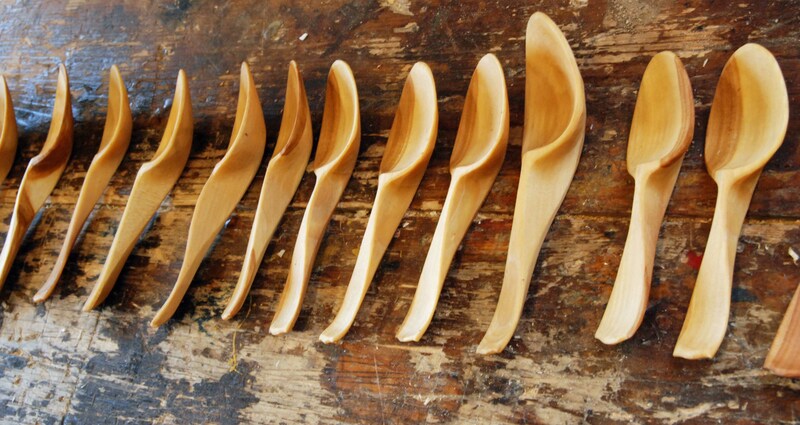 Her 2-day class in carving eating spoons produced some of the nicest spoons – there were no clunkers at all. 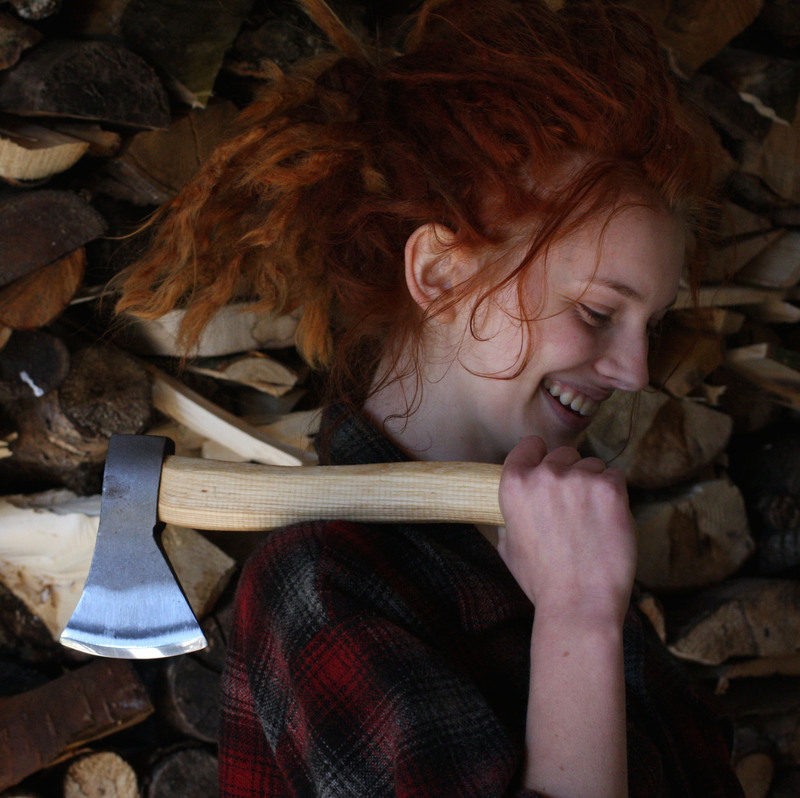 Step-by-step she showed how she uses the hatchet and knives to work a disciplined shape that performs just as it should. JoJo & I were on the festival circuit last summer; here in Plymouth, then England & Sweden in August. I got to see a lot of her carving, and it keeps getting better. I wrote a profile of her & her work in Popular Woodworking Magazine, #229, December, 2016. Come see for yourself. Your spoons will take off. Her eating spoon class before the festival is not to be missed. We expect it to sell out, so if you want to get in it, registration opens January 4th. http://www.greenwoodfest.org/ I’ll have reminders here, and the Plymouth CRAFT newsletter will announce it too. sign up for the newsletter if you haven’t already (under the “registration” tab on the GWF site). JoJo Wood taught her master class in eating spoons. 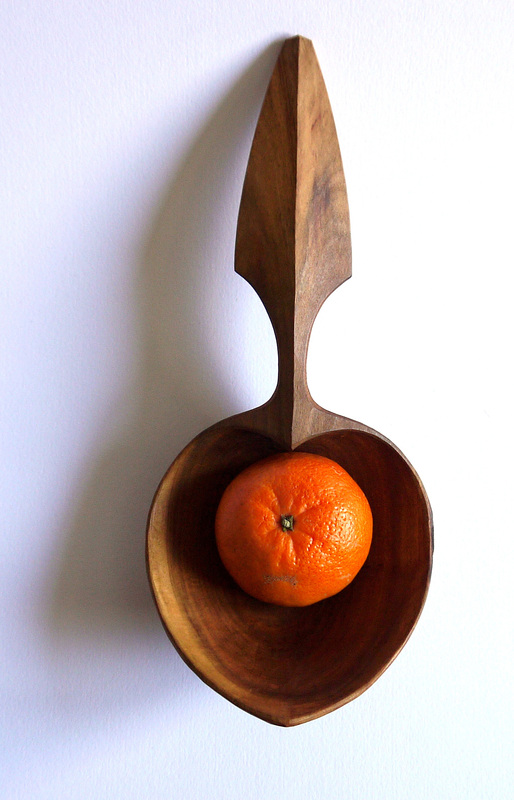 These are the hardest spoons to make – they HAVE to be right. Cooking spoons & serving spoons can be strange & still work. Just look at my work for evidence of this. 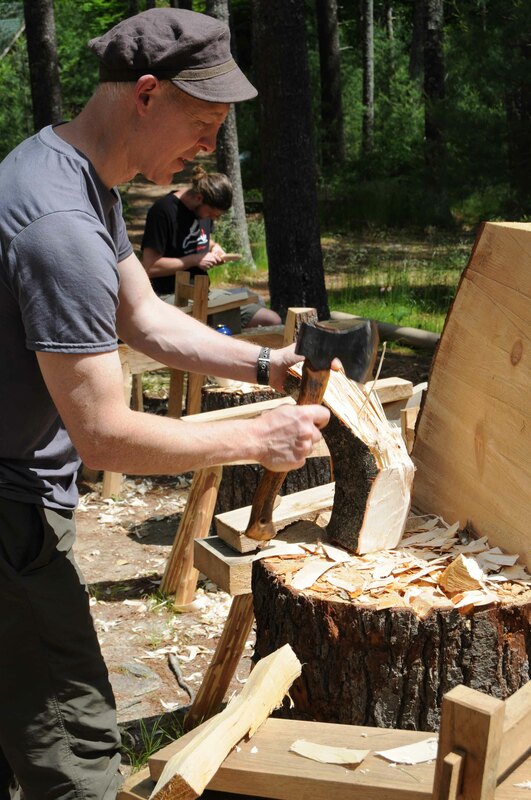 Meanwhile, Jogge Sundqvist taught his distaff class…a real challenging exercise in shapes, knife, hatchet & drawknife work, & design. The tin-can opener grasp can be hard to grasp. Jogge helps illustrate proper technique. Showing where some of these cuts are applicable in spoon carving. Except this one – it doesn’t count. It’s Dave Fisher! This short film has been bopping around the web today; I’ll add it here just in case some have missed it. Plymouth CRAFT is now a year old. http://www.plymouthcraft.org/ It’s an organization with which I’m thrilled to be involved. After a great first year, 2016 looks to be even better. As you have read here, Greenwood Fest in June will be a memorable event. I’ve been working with Paula Marcoux as we coax all the instructors for details about their sessions. We’re close to the point now where Paula & I have to sit and figure out who does what where & when. In the meantime, Paula took the chicken way out and booked two workshops that happen after the festival. We had wanted to pursue having the instructors stay a few extra days and teach in-depth classes – but the hardest part was deciding how much of that we could do, then who to tap. It being our first venture, we decided to have just 2 classes – that’s enough for now. 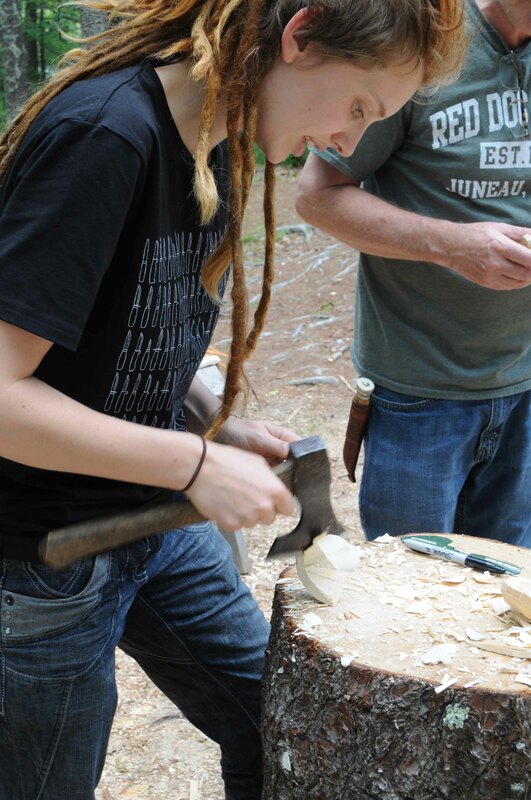 These classes will be held at the Pinewoods camp where the Greenwood Fest is happening. Dates are Tuesday and Wednesday, June 14 & 15. 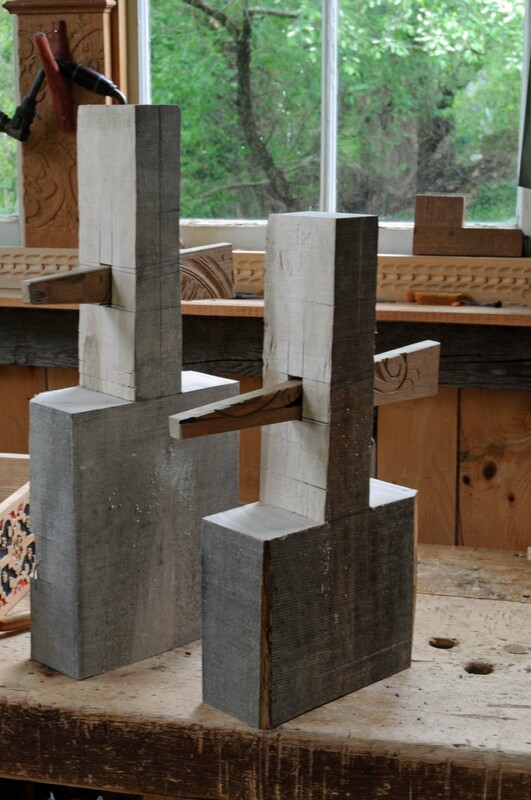 Tomorrow registration will open for these small classes – one with JoJo Wood and one with Jögge Sundqvist. JoJo will explore the finer points of spoon design, concentrating on the most demanding spoon, the eating spoon. I spent about 20 minutes carving with JoJo once and it changed the way I approach things. This class will be small, 10 students. And it will push you in ways you can’t fathom. Jögge has a treat in store, making a distaff…”A what?” you say. This class is a crash course in Swedish design, tradition, culture and more. 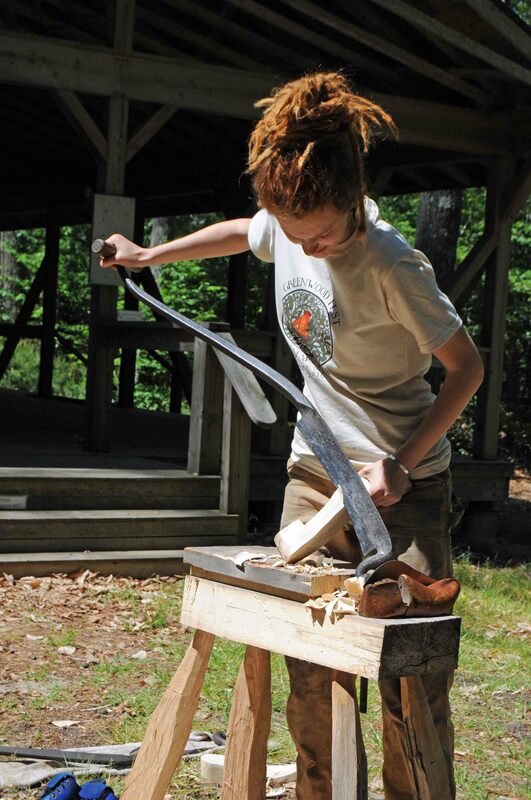 Emphasis is on the use of the drawknife, slojd knife, and a couple of other common hand tools. This is a class in technique and thought, not a project-based workshop. Yes, a distaff is a useful thing, for spinners. Here, it’s a symbol. I’ll be skulking around both of those days, trying to eavesdrop on these two exciting workshops. If you can’t make it to those classes, or need a warm-up, I have a spoon carving class with a few openings left; coming up in February. Spring of 2014. There I was. Just finished shooting my video Carving Wooden Spoons with Lie-Nielsen https://www.lie-nielsen.com/product/carving-wooden-spoons-with-peter-follansbee. Just gave notice to my then-employers that I was striking out on my own. 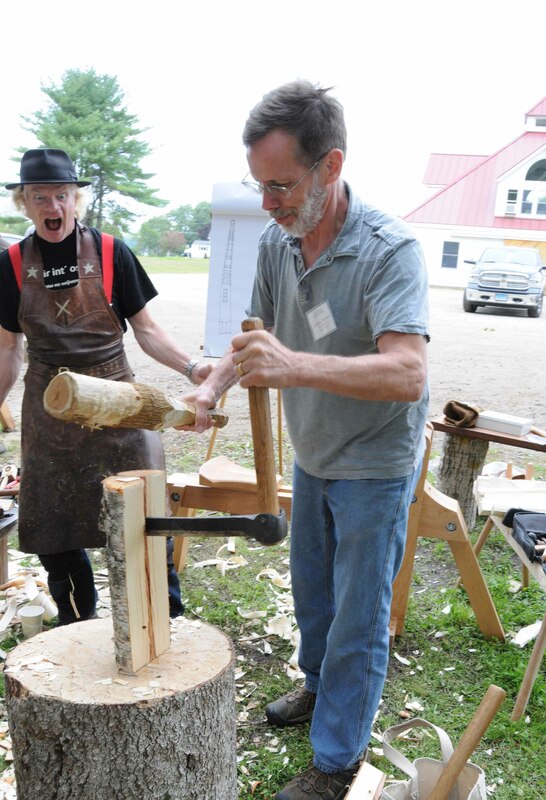 And, off for a great vacation to Lake Woebegon to meet Jarrod Stone Dahl and Robin Wood – enrolled as a student in Robin’s first bowl turning class at North House Folk School. The lesson? We can learn from all kinds of people, young & old. 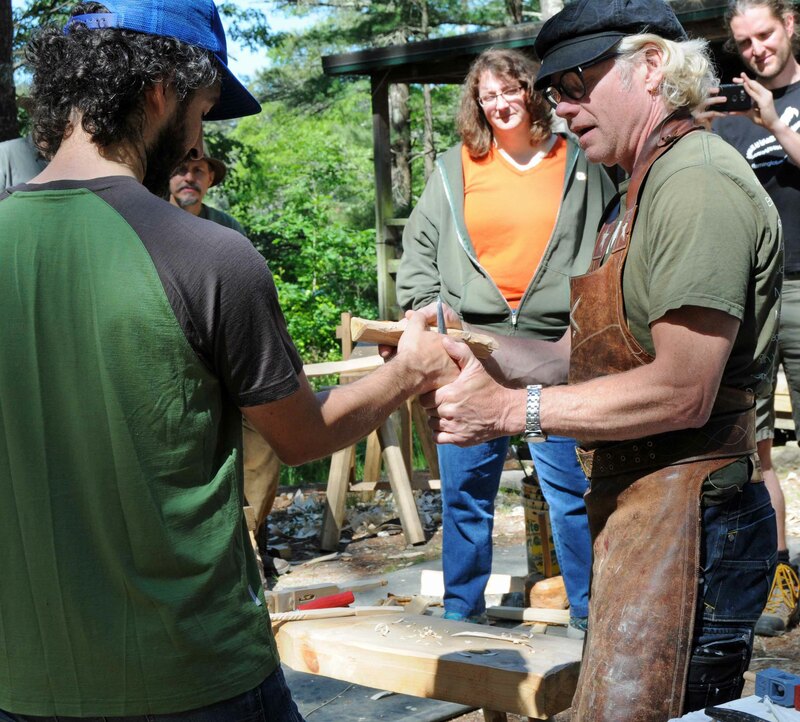 Woodworking instructors don’t have to be 60-yr old grey-haired men. And, now – your turn. JoJo is coming to Greenwood Fest to show us what’s what. Her work is great…she puts more thought into spoons than you can imagine. She really breathes these things. 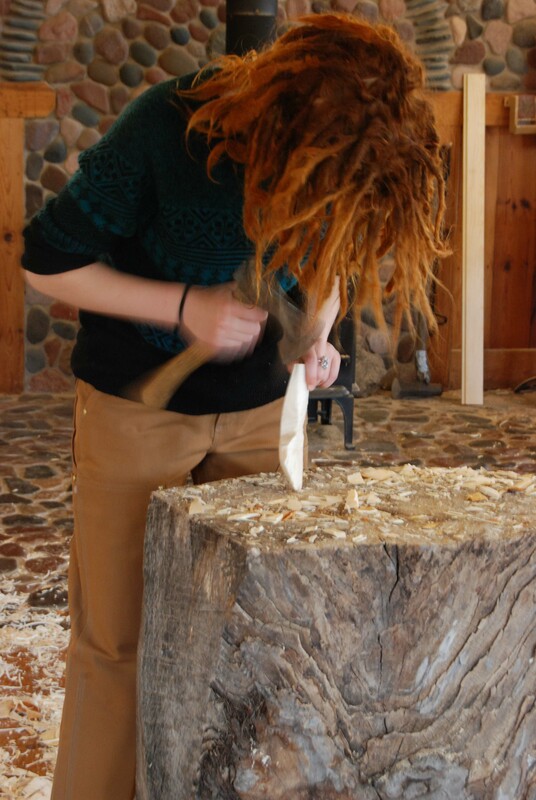 AND – she’s hoping to be able to bring some of her clog-making tools to show us some of that as well. Here’s a blurb she wrote up, at great personal cost to herself. and yes, JoJo – I wanted you to be a part of Greenwood Fest because you inspire young people and women to take up edge tools, but also because you’re good at it.